This stunning custom design combines true modern architecture with a pallet of materials that makes this home a perfect backdrop for easy living. 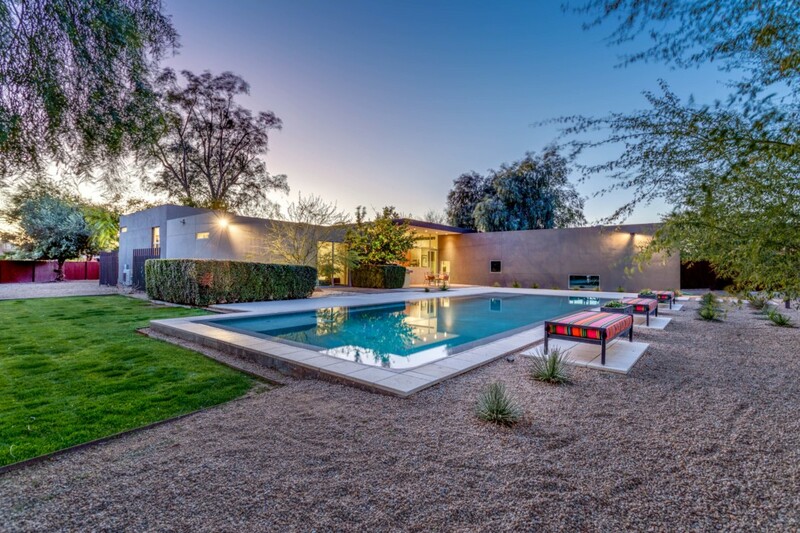 Highest quality craftsmanship is evident throughout: This house was designed and built by The Construction Zone, one of the Valley’s premier custom architectural design/build contractors. A tree lined pathway leads you to the oversized offset pivot entry door, completely custom featuring stacked glass door-lights. The sun-filled interiors offer ample overhangs and clerestory windows that keep this home light and bright, yet protected from harsh sun. With a split floor-plan that includes a secluded master suite, separate guest room and Study wing with bonus flex room and two additional bedrooms, you’ll find this home perfect for just about any lifestyle. 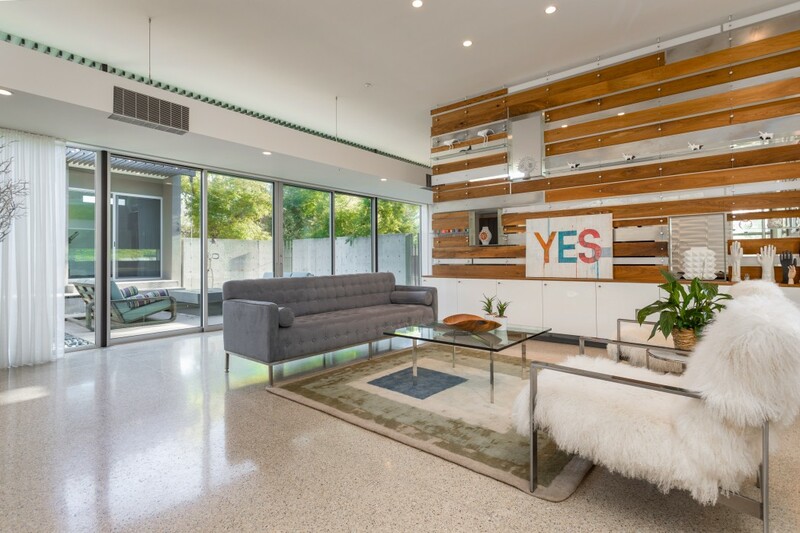 Excepting the workout/den/office conveniently located off of the master suite, this home is all on one level and showcases stunning, honed abalone shell and white concrete terrazzo floors. 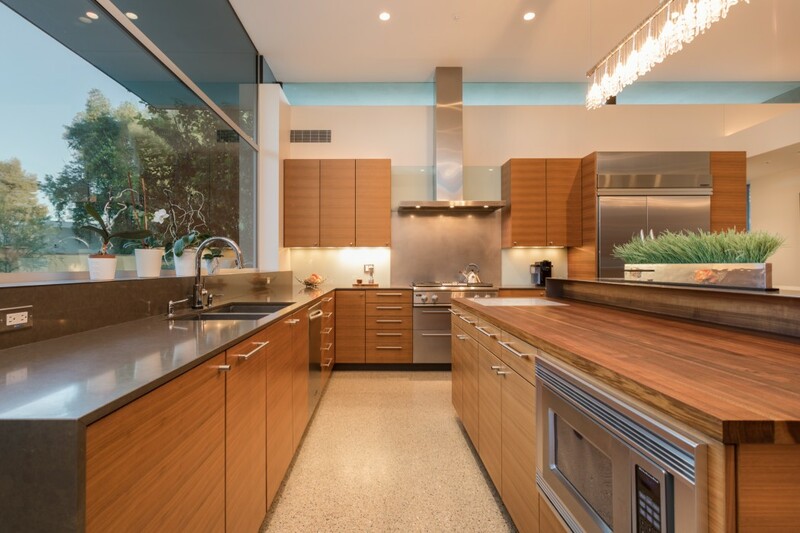 The Great Room offers an oversized kitchen with eat-in prep island, select and matched walnut cabinets, stainless steel, quartz composite and wood block counters, glass back-splash, double wall ovens, and gas cook-top, enough to please the most gourmet of chefs. The walk-in pantry/laundry make storage simple. 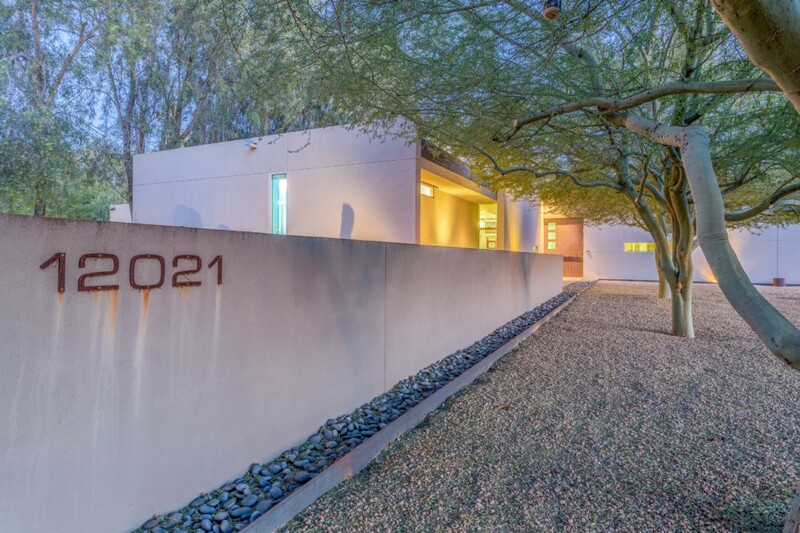 Ten+ foot ceilings and floor-to-ceiling glass and doors connect you to the outside as only a custom modern home can. Perforated “screen” walls and shelving divide the space allowing for a playful interaction between the living and family room. No-one will feel left out. This is a home for entertaining: outside you’ll find connected patios including a center court off of the living space for intimate outdoor gatherings, while this oversized yard accommodates an infinity edge pool, a large natural grass play space, architectural screen-walls, a covered modern “gazebo” complete with fireplace and lighting. The BBQ is conveniently located off a kitchen patio for easy access and a great place to take your morning coffee! Located on a large corner lot in the private, guard-gated community of Equestrian Manor, your security and privacy are all but assured. This exclusive neighborhood offers a superb location, yet you’ll stroll though quiet streets and cul-de-sac lanes making this a relaxing place to call home. Scottsdale Schools are a plus. Hurry: this custom modern home is being offered for the first time far under the replacement value. Shown only by appointment, contact us today for a private tour.